This book delivers end-to-end coverage of recent advances in both the theory and practical design of ultra wideband (UWB) communication networks. Contributions offer a worldwide perspective on new and emerging applications, including WPAN, sensor and ad hoc networks, wireless telemetry, and telemedicine. The book explores issues related to the physical layer, medium access layer, and networking layer. Case studies present examples such as network and transceiver design, assisting the reader in understanding the application of theory to real-world tasks. 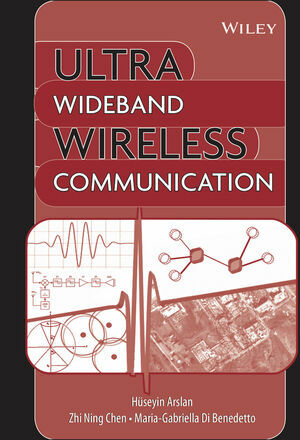 Ultra Wideband Wireless Communication enables technical professionals, graduate students, engineers, scientists, and academic and professional researchers in mobile and wireless communications to become conversant with the latest theory and applications by offering a survey of all important topics in the field. It also serves as an advanced mathematical treatise; however, the book is organized to allow non-technical readers to bypass the mathematical treatments and still gain an excellent understanding of both theory and practice. HÜSEYIN ARSLAN, PhD, is Assistant Professor at the University of South Florida. Dr. Arslan's research interests center on advanced signal processing techniques at the physical layer, with cross-layer design for network adaptivity and quality of service control. He worked at Ericsson Research for about five years and continues his close relations with wireless industries as a consultant and with university sponsored research. ZHI NING CHEN, PhD, is Adjunct Professor in the Electromagnetics Academy at Zhejiang University, China and at the National University of Singapore. Dr. Chen is also Lead Scientist at the Institute for Infocomm Research. MARIA-GABRIELLA DI BENEDETTO, PhD, is Professor of Telecommunications at the University of Rome La Sapienza, Italy. Dr. Di Benedetto is active in fostering the development of UWB telecommunication systems in Europe and is the Director at Infocom for two European IST projects.